Ladies and gentlemen, we give you... Scooter! We have to stretch WAYYY back for this one! 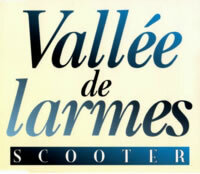 "Vallée Des Larmes", which translates to "Valley of Tears", is Scooter's very first release ever. After spending some time as the remix team The Loop!, the three men from Germany (H.P. Baxxter, Rick J. Jordan, and Ferris Bueller) started up a new project called Scooter. After spending a little time in the studio, they popped out "Vallée Des Larmes", a purely instrumental dance track based on a song of the same name by René & Gaston. That's right: H.P. Baxxter's now automatic rapping and inane lyricisms had not yet come to fruition! Though Scooter was just a test project, the song hit #8 on the German charts, so they decided to keep going with it. The rest is history. Their debut single begins with the Original Version. After a few beats, the twinkling of xylophonic beats enters, alongside bass and faux brass instrumentation. Later on, more standard beats and synths play along to a fairly tame melody -- definitely bland on its own merit, though improved somewhat by the catchy rhythm. And the song then starts to essentially go backwards, reverting to the xylophone arpeggiation again and the brass synths from before. Is this a stellar song? No, not by any means. But everyone has to start somewhere. The Percapella Version does little to improve the situation: it is a shortened and simplified version of the original, but lacking the thumping beats that made it club-suitable. And the Re-Incarnation By The Loop! Remix isn't all that much different from the original; it's more of a radio length and with all the elements of the original version intact, beats and all. There's also a completely different B-Side at the end in Cosmos, a song later included on their debut album, "...And The Beat Goes On! ", but this version is without any vocals from frontman H.P. Baxxter. It's a more relaxing trance tune at first with strange wailing synthetic female voices, later adding a beat and an arpeggiated melody (and another one later using a stronger synth). With the raw power right in the middle of this one, I can easily declare this as the strong point of the release and a track worth examining. I can't really fault them too heavily on this release; it was their first try as a new musical group on the scene and their only experience in the dance music field thus far was as a remixer, rather than an original creator. (No, their time as the synthpop band Celebrate The Nun in the 1980s doesn't quite count -- that wasn't rave music!) However, the success of "Vallée Des Larmes" allowed them to continue and produce far more notable hits in the future. So we salute this single for bringing us greater goods down the road. As for the song itself, it's mildly catchy, but you should really be checking out the B-Side if you want quality rave tunage.